Pure Craft Beverages™ Bubbler Program. Crafted For You™. HOUSTON, TX — (July 10, 2018) Sunny Sky Products, LLC. is excited to introduce the new line extension from Pure Craft Beverages™. The new Pure line includes hand-crafted bubbler juices, teas, and lemonades that will give consumers the ultimate beverage experience they have been craving. With a wide range of flavors offered, Pure Craft Beverages boasts superior flavor quality, with a pure difference you can taste. The Pure line is perfectly balanced with a mix of traditional flavor offerings as well as more complex and on-trend flavors that will add excitement to your bubbler program. The flavor spectrum consists of refreshing classics such as Berry Tea and Strawberry Watermelon to our innovative lineup consisting of Ginger Pear and Raspberry Hibiscus Tea. The “crafted for you” beverages are made with real sugar, real juice, natural flavors and are free of high fructose corn syrup or HFCS. 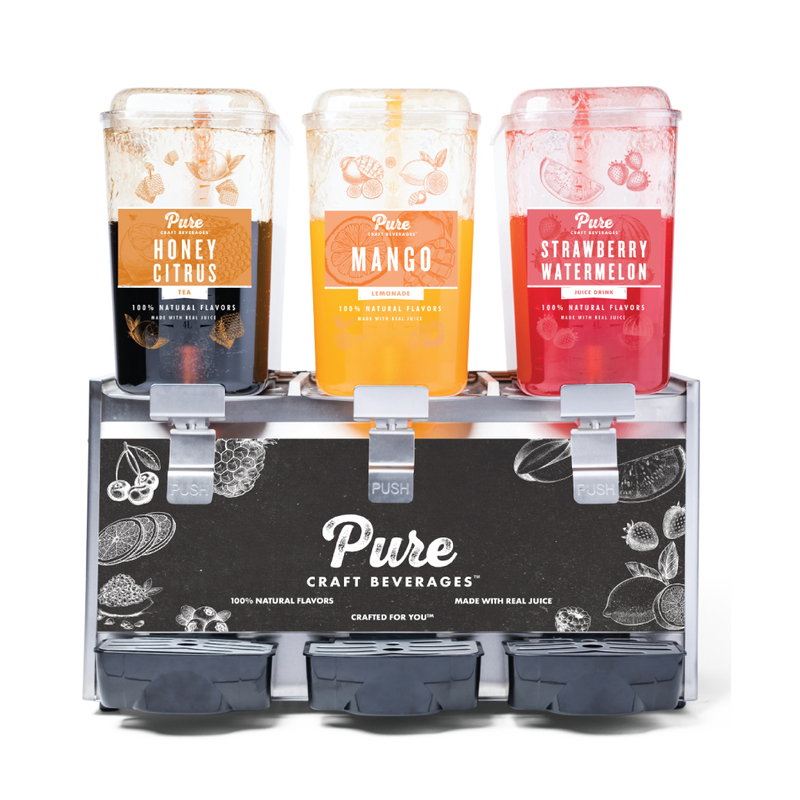 Pure Craft Beverages Bubblers are sold in .5 gallon bottles. The new craft beverage line will be available starting July 10th 2018 through select broad-line distributors. For more information on our full line up of Bubbler products, click here. Based in Houston, TX, Sunny Sky Products, LLC is a premium dispensed beverage manufacturer of cold dispensed, hot dispensed, frozen beverages and beverage enhancers for convenience stores, schools and restaurants since 1999. Their product portfolio includes brands such as Hershey’s Freeze, Jolly Rancher Slush, Pure Craft Beverages™, El Nino Aguas Frescas® and Original Slushie Company®. Sunny Sky Products distribute their products in over 20 countries worldwide.